Salendine Nook High School is an 11-16 community comprehensive school established in 1973, when secondary education in Huddersfield was re-organised. The school is housed in the former Salendine Nook Secondary School and Huddersfield High School buildings. The school became an Academy in 2012. The school shares a site with Huddersfield New College which caters for sixth form students. The campus is situated on the western side of Huddersfield, two miles from the town centre and about a mile from Exits 23 and 24 of the M62 motorway. There are many facilities on the campus: 65 acres of playing fields, an indoor heated swimming pool, an athletics track, tennis courts and a 3G all-weather pitch. The school has specialist rooms for all aspects of Technology, Art, Music and Drama, ten laboratories for Science, a library / resource centre and two gymnasia. There are five computer rooms with a network linked to other rooms and a resources room for reprographics. There are currently 1348 students on roll, 84 teaching staff and 58 support staff. At all times, the staff at Salendine Nook High School aim to create a happy and purposeful atmosphere in which pupils can develop their academic and social potential. Enrichment sessions are Wednesday mornings 8.10-9.10am (gifted and talented swim team) and Monday (any ability) 3.15-4pm. Both sessions are for any year group. The pool is also used by primary schools in the catchment area as well as the pupils of SNHS. 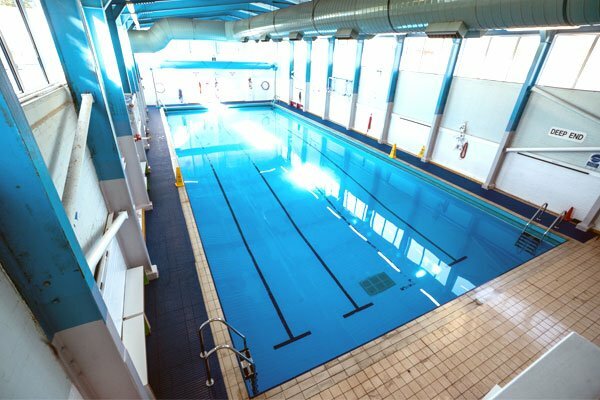 During evenings and weekends the pool is hired out by SPIE to private swim schools in the local area. Here at Salendine Nook we are lucky enough to have our own Swimming Pool, which is used 50% of the week for SNHS pupils. All sessions are delivered in a safe, learner friendly environment. Not only do pupils learn a lifesaving skill or improve the skills they already have; the aquatic curriculum allows for a broad range of topics and disciplines to be explored and developed within the physical education (PE) framework. Core PE in Year 7 develops pupils’ stroke techniques and speed swimming, including types of fitness emphasising the importance of healthily lifestyles and gaining insight into GCSE PE language. Gifted and talented swimmers have the opportunity to represent their forms in an annual Year 7 inter-form gala held in the Summer term. In year 8 the focus is on Personal Survival within a real life context and Water Polo is experienced using various drills and skills leading to modified invasion games. If pupils opt for Swimming as part of core PE in year 10 and 11 the previously taught topics can be explored further, and or pupils can undertake a nationally recognised program of study in Lifesaving and First Aid. This is an ideal pre-requisite for pupils wishing to embark on a Lifeguard qualification upon leaving school. Throughout the year there are opportunities for pupils to be selected to represent the school at an annual year 7 and year 8 Inter-school swimming gala hosted at our pool. In addition time trials are also held once a year to select a swimming team to represent the school in the English Schools Swimming Championships held at various sites within Yorkshire. Enrichment sessions are made available twice a week for pupils wishing to accelerate their progress, become more confident, top-up GCSE skills or simply keep fit. Book-stock of around 9000 titles suitable from toddler to adult. A small collection of audio tapes and CDs, often with accompanying books. 15 networked computers with internet access. 5 large tables with chairs, enough for a whole class to work at. A small, comfortable reading area. Equipment to borrow such as: pens, pencils, rulers, crayons, paper, scissors and more. Large notice boards with reading ideas and information. All staff and pupils are allowed to borrow books to take home. The basic allocation is 4 books at a time. This allocation can be increased, dependant on the pupil being a ‘good’ borrower, which includes bringing resources back on time. The books are issued for a period of 4 weeks. They can be renewed for further periods as often as required unless other pupils are queuing for them. There are no fines for late books, but if the resources are kept for a long time, it will be assumed that they have been lost and a donation to cover their replacement will be expected. Overdue letters for late items are sent to the pupils in the first instance, via the form registers, and then parents are notified by email or text. During the busy period of lunchtime, Pupil Library Assistants work at the counter issuing and returning the books. These pupils are chosen from Years 8 and 9 and work in teams. They are rewarded with credits and occasional treats. Names of pupils wishing to help out in this way are taken during the summer term. In order to acquire as many up-to-date books as possible, the library periodically sends out book catalogues via form tutors from which pupils can purchase selected titles. Any books purchased from these magazines donate free books to the library. The library is always grateful for donations of suitable books which staff, parents and pupils have finished with at home. All pupils in Year 7 and 8 have an hour session reading in the library, during one of their English lessons, every fortnight. Pupils are encouraged to keep the books that have been chosen for these sessions in their bags so that they can use them at any time, especially since English lessons start with a 10 minute read and their form class usually has a reading session one registration a week. We hope that they will also read them at home (not forgetting to put them back in their bags afterwards). 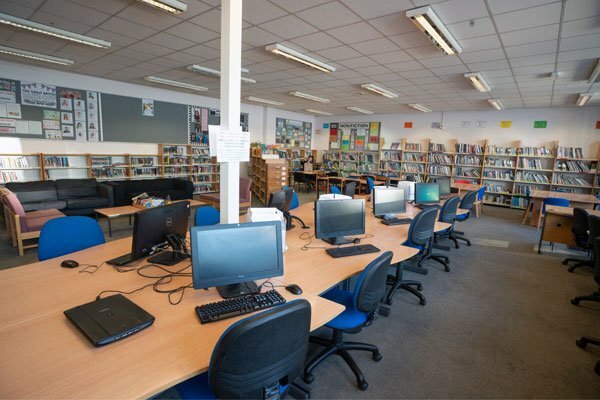 Pupils can also bring in their own books from home and can bring e-book readers, which can be stored safely in the library during the day, if required. Unfortunately due to curriculum pressures older students rarely have the chance to read in the library in an organised fashion; though we hope that by this age they will be reading independently and borrowing books to take home. Available for book loans, printing and peer mentoring. English classes booked for reading sessions on a timetabled basis and other classes using the facilities on a bookable basis. Individuals and small groups sent by staff. Booking for lunch, printing and borrowing books. Booked lunchtime session (80 places available). Extra places at the librarian’s discretion. Available for doing homework, either using the tables/books or computers (15). Reading, borrowing books and printing. The Sports hall is a fully equipped indoor facility. It has a full size Basketball, Netball, Handball and Volleyball court, with 4 Badminton Courts. There are 8 Basketball hoops on the side of the courts and 2 additional basketball hoops that are electronically lowered for the main court. The Sports hall also has a full set of cricket nets for indoor batting practice.